Various types of electrical connectors are used on fuel injectors, all of them have just two contacts. and most of the newer designs are waterproofed to prevent corrosion. Each will require the proper type of connector. Only found on the early Bosch and Bendix hose-end type of injectors. The most common type, used on Bosch injectors until the late 90's. Also found on some Denso and JECS injectors. Note the centered tab both inside and on the outer perimeter. Used on a few JECS and Denso injectors. Found on newer Bosch injectors. Only on the new slim bodied Delphi injectors. 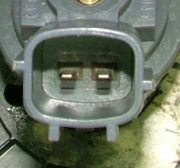 Usually found on newer Denso and JECs injectors. Similar to the one shown above, also used on Denso and JECS injectors. Careful examination and you can note the different side tab location from the one above. Rectangular with rounded corners and has tabs on both the sides and bottom. This type is found on JECS side-feed injectors.